Back to being energetic today, after a rest-day! 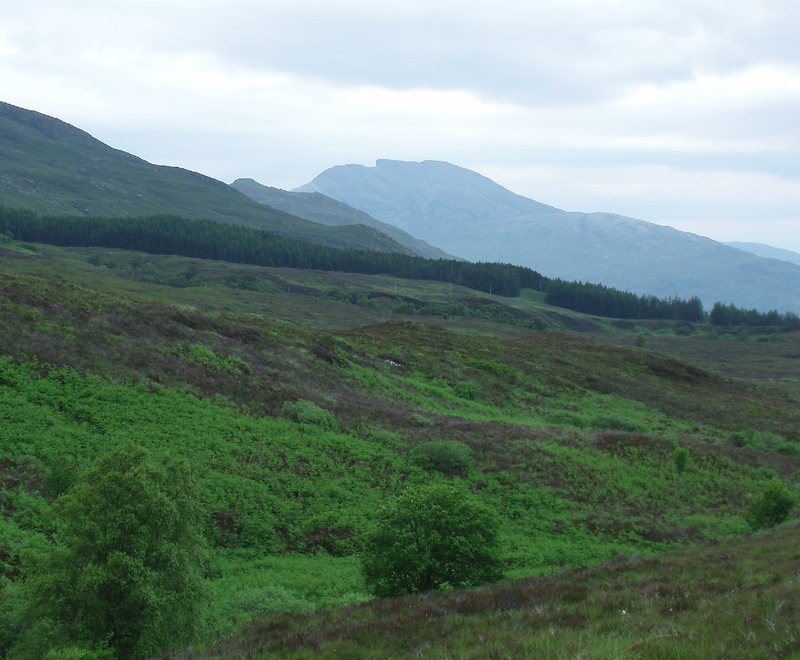 Beinn Liath Mhor (pronounced Ben Lia Vorr) is in the heart of the Coulin Forest, a good way in from either Glen Carron or Glen Torridon. 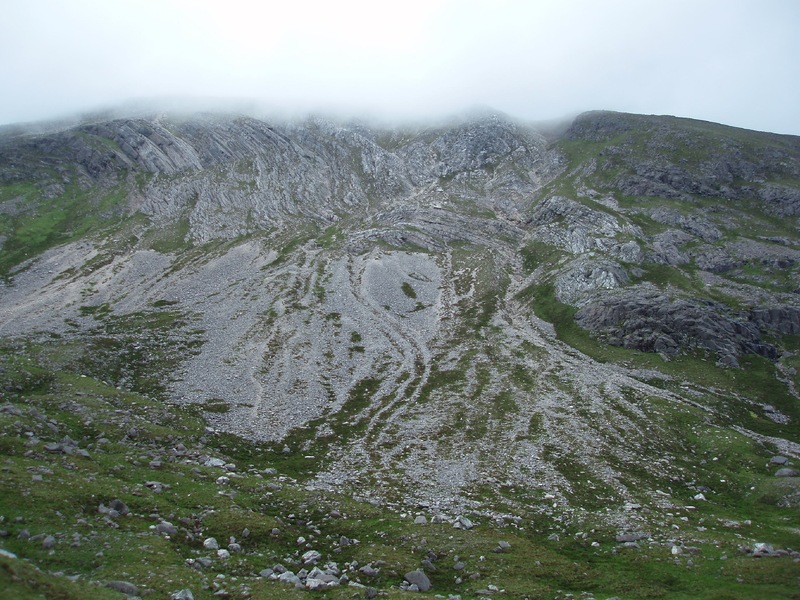 Usually it's climbed from the former, starting at Achnashellach Station, going up to the head of the long and magnificent Coire Lair. 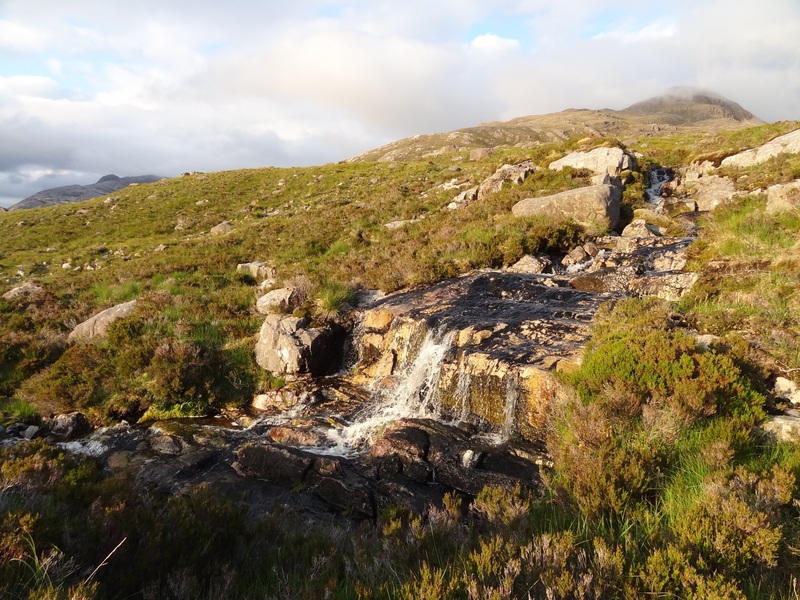 There are lots of reports on this route on The WalkHighlands website, listed under Beinn Liath Mhor. 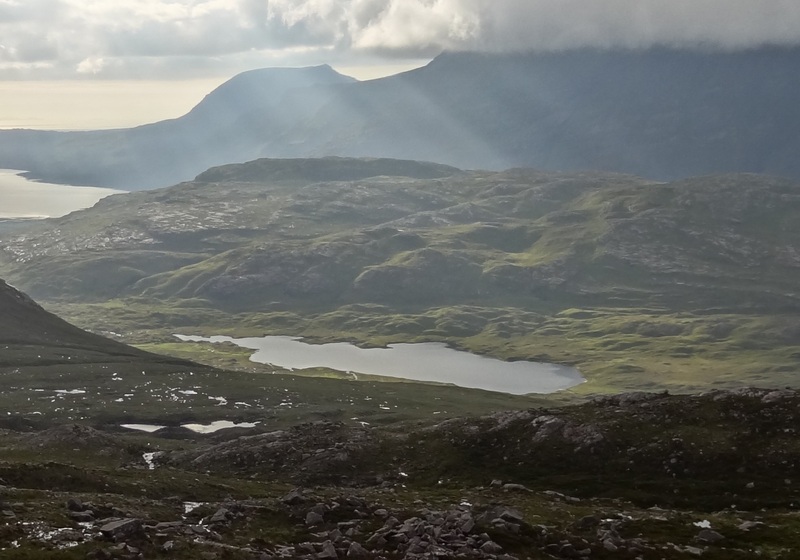 We particularly recommend DogPlodder's report - lovely, personal writing, as well as some great photos. But there are other really good ones. 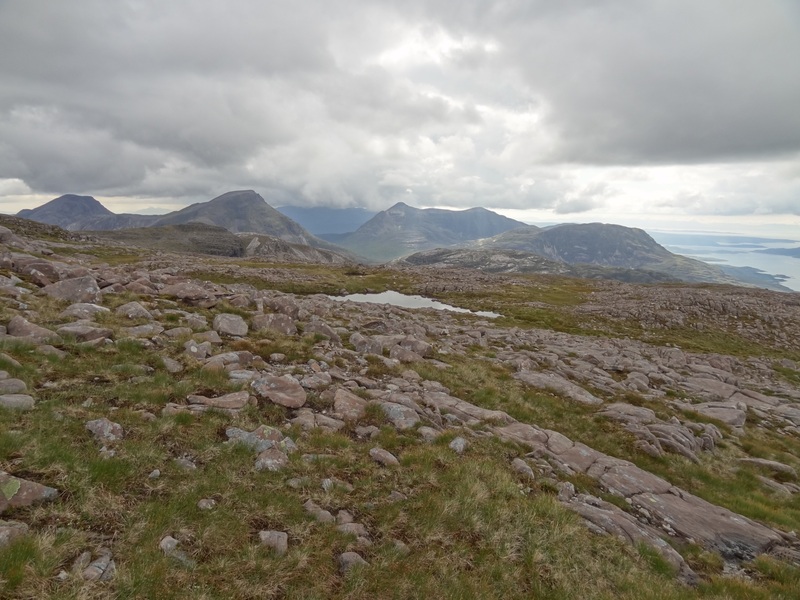 From the start of the path from Alligin to Rechullin (just east of Alligin): a sweep of mountains with Sgorr A'Chadail and Mullach an Rathain near left, and Beinn n'Eaglaise on the right. 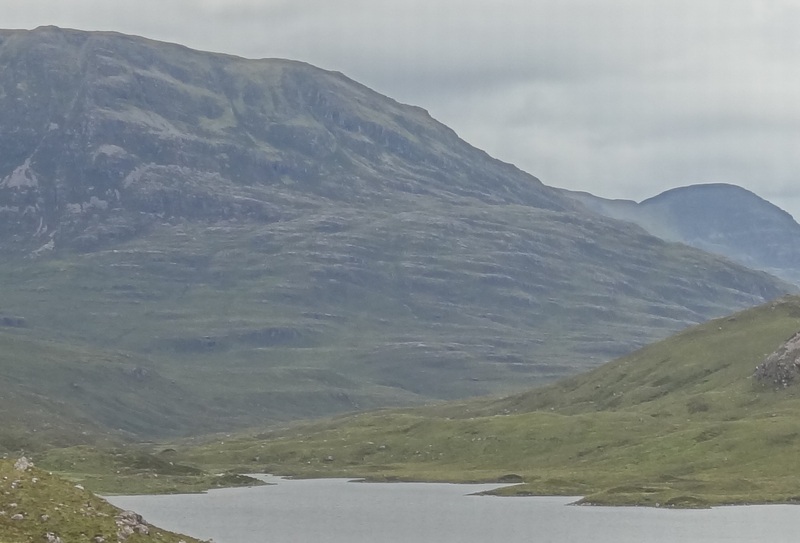 In the middle, at the head of the loch, is Sgorr an Lochan Uaine (left), Beinn Liath Mhor (centre), and Sgorr Ruadh (right). 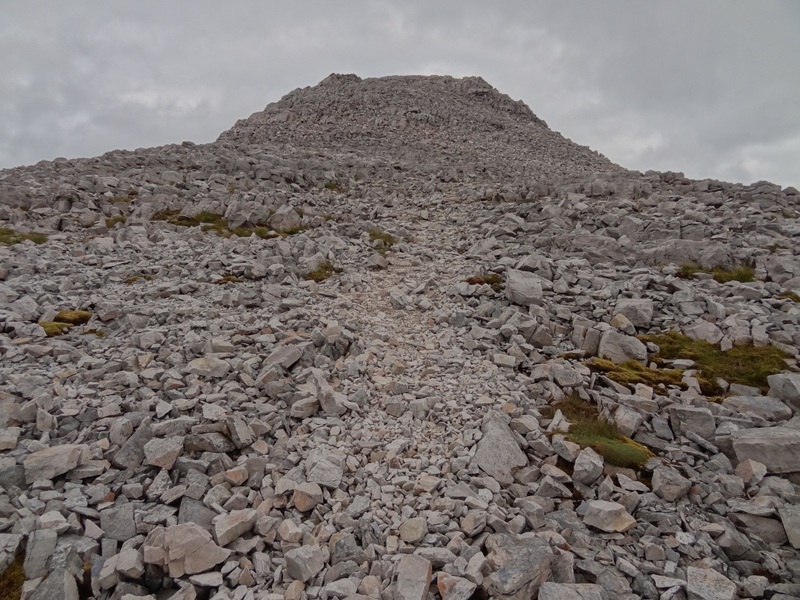 The previous year we walked as far as the head of Coire Lair, and, even on a day of much duller and more restricted light than we had for Beinn Liath Mhor, it was incredible. 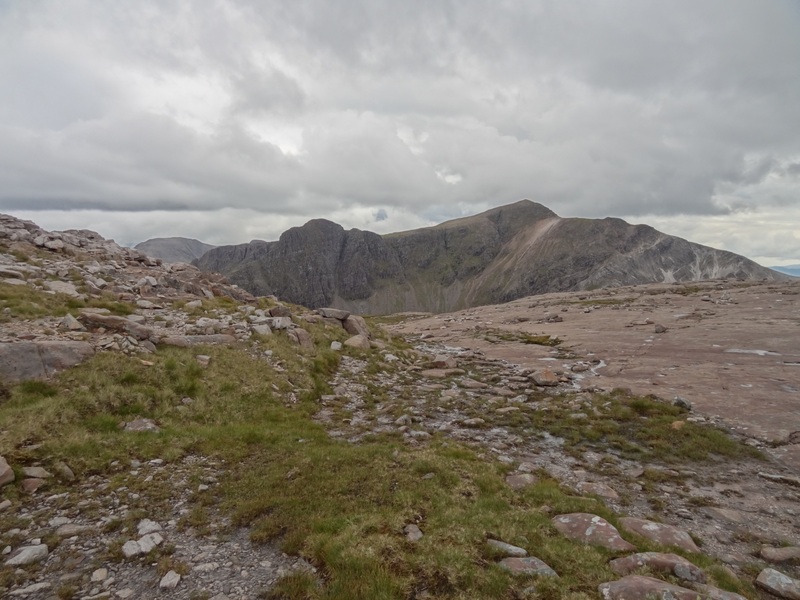 So we're not at all saying that climbing the Beinn from the north is better. 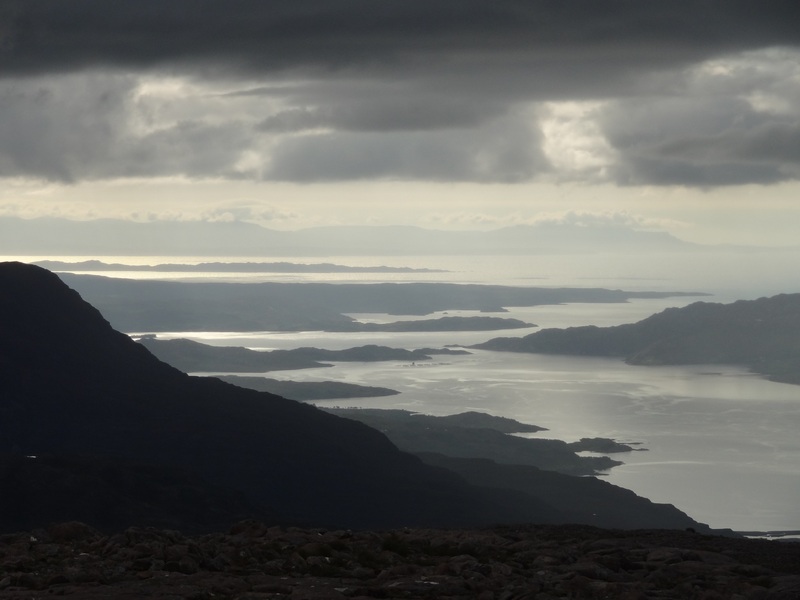 The great views we had over Loch Torridon and out to Skye are pretty much as good as they get from the summit anyway. 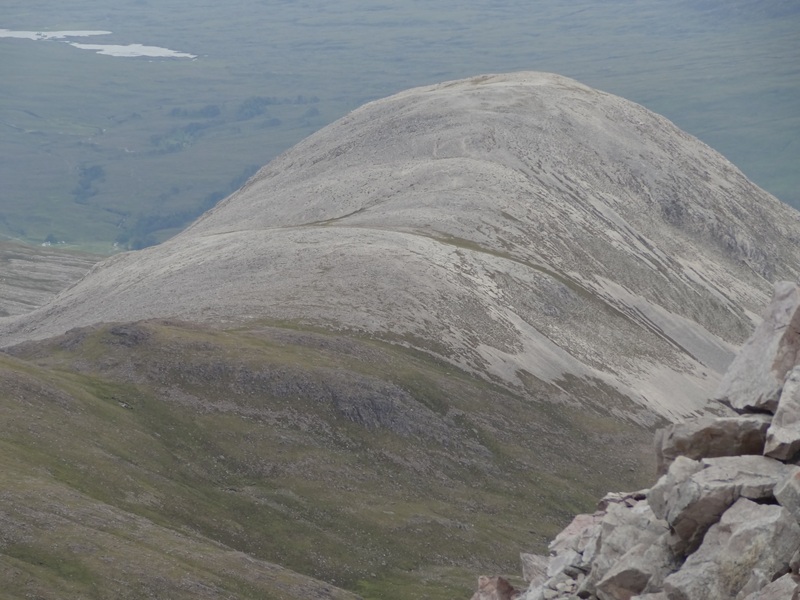 The summit ridge also gives a wonderful depth to Coire Lair, and is a great viewpoint in general. So in many ways, if you have cloud-free tops, any approach route will amply reward the effort. 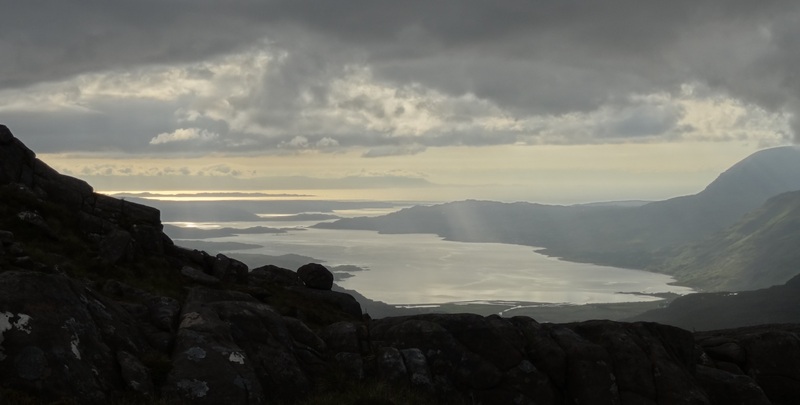 We did enjoy sea views for longer on the descent, which was just lucky as the light turned good then. 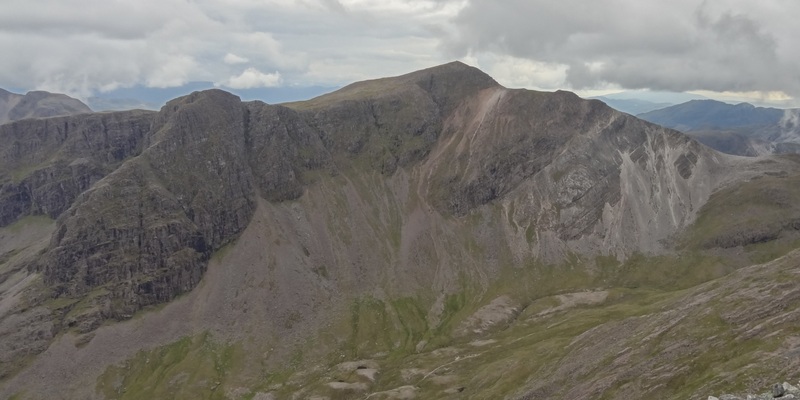 Whilst the north route misses out on Coire Lair, it does pass through the Coire a Cheud Chnoc (Corrie of a hundred hills). 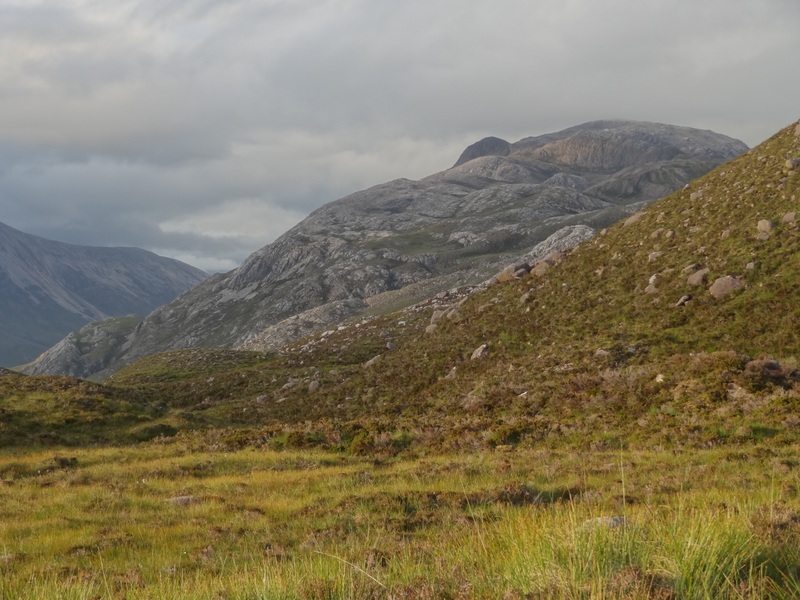 It gives shallower, perhaps more subtle views of the hillocks than the classic views from below in Glen Torridon (or above on Liathach!). 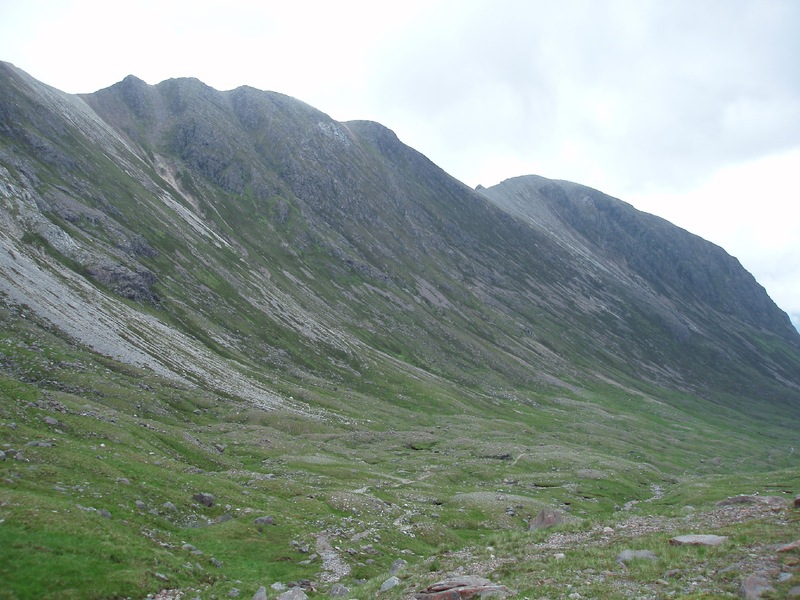 Mind you, Coire Lair has some pretty good moraines above the path junction that goes off over Drochaid Coire Lair towards Easan Dorcha and the Coulin pass. 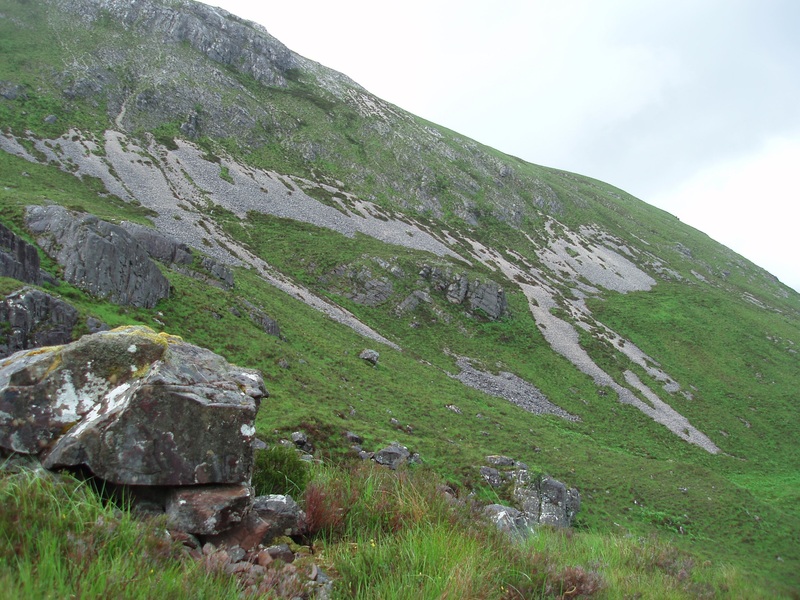 As with our walk two days later on Sgorr a Chadail and Mullach an Rathain , we took confidence from Peter Barton. 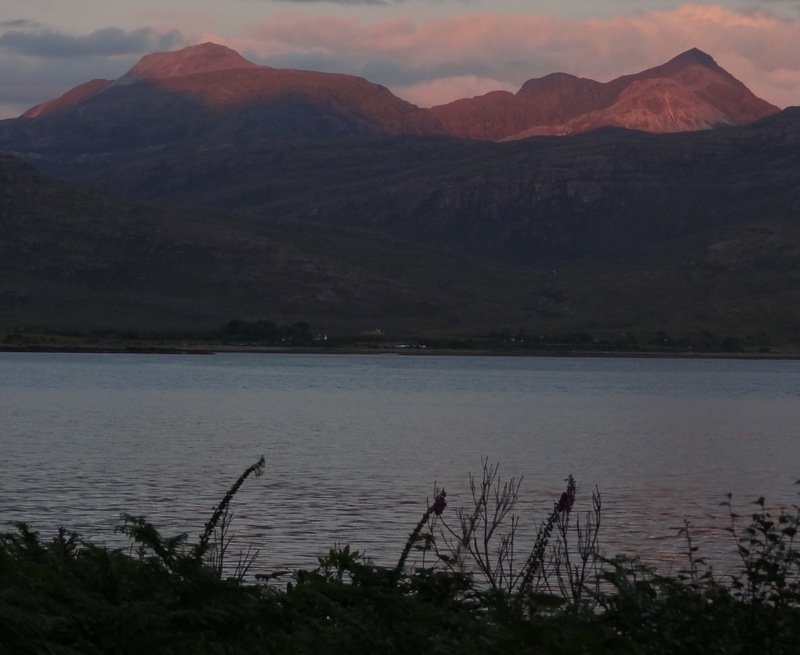 Staying at Lochside, on the north side of Loch Torridon, there was no way we'd have managed to get Achnashellach station on foot or bike, to start the walk, and get back: we're not that fit! 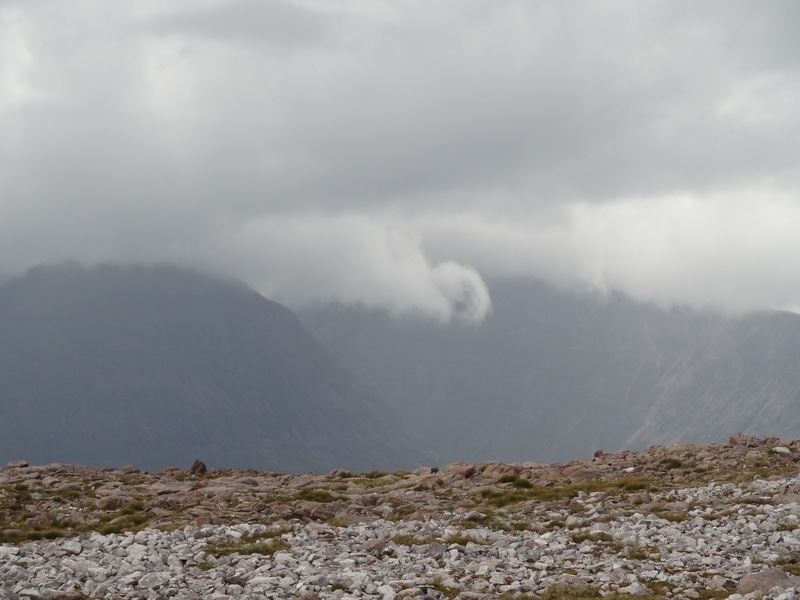 So we wondered about climbing it from the Ling Hut at the top end of Glen Torridon. 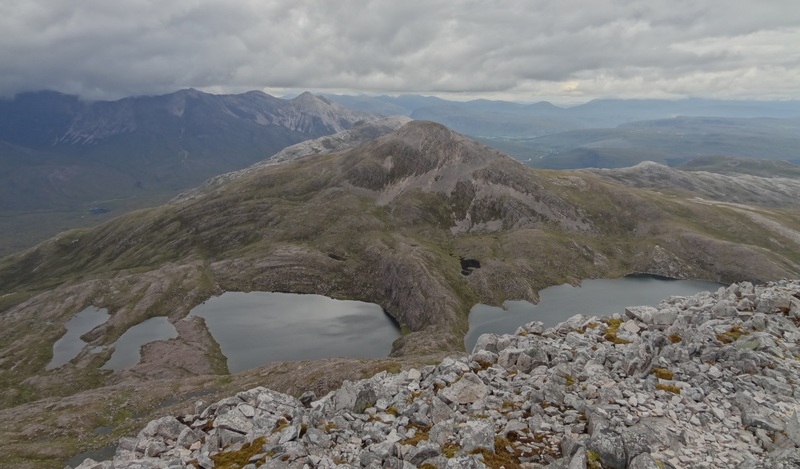 Peter Barton's excellent Cicerone guide on walking in Torridon includes a few more unusual routes up familiar peaks. We didn't follow his route exactly, but we found his descriptions, particularly of what was more or less hard going, to be very helpful. 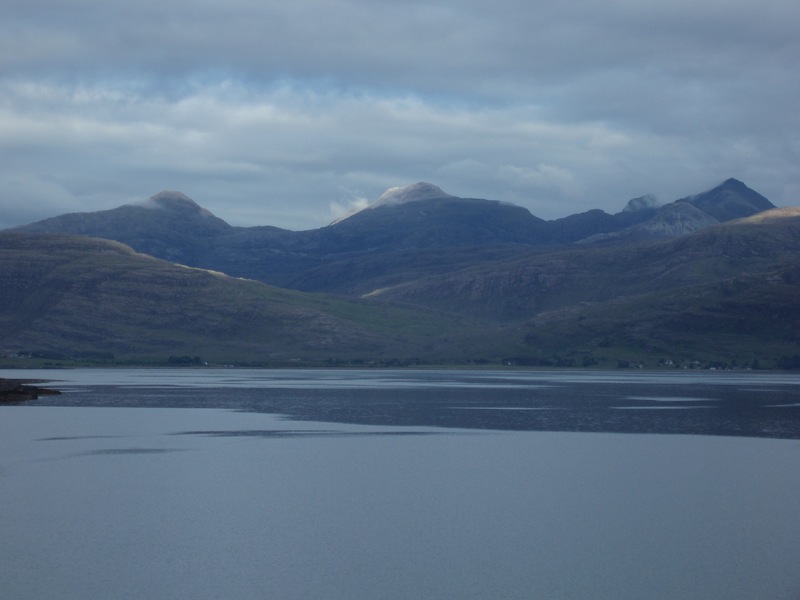 With a good forecast, it started dry but with quite thick cloud cover, shrouding the tops. In fact, the cloud yo-yo-ed on and off the tops all day. 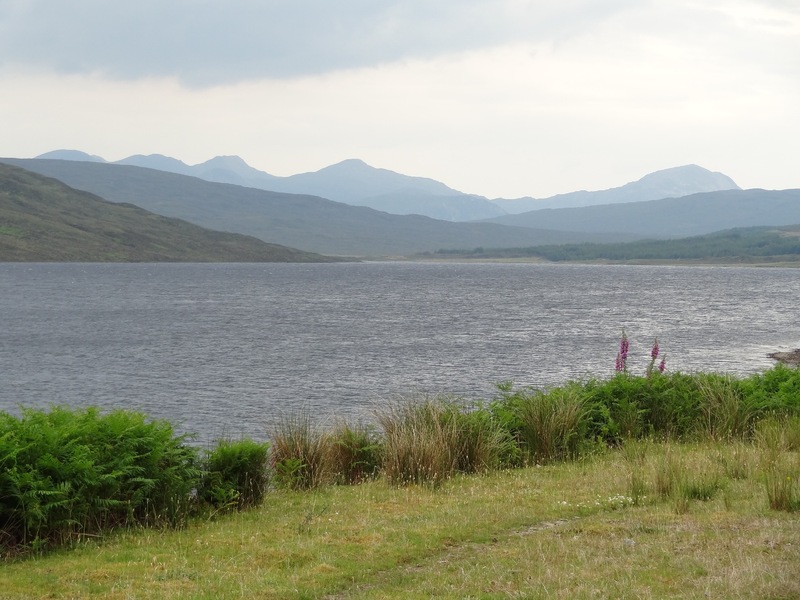 We started off from Lochside at about 10.30 and cycled up to the Ling Hut carpark. 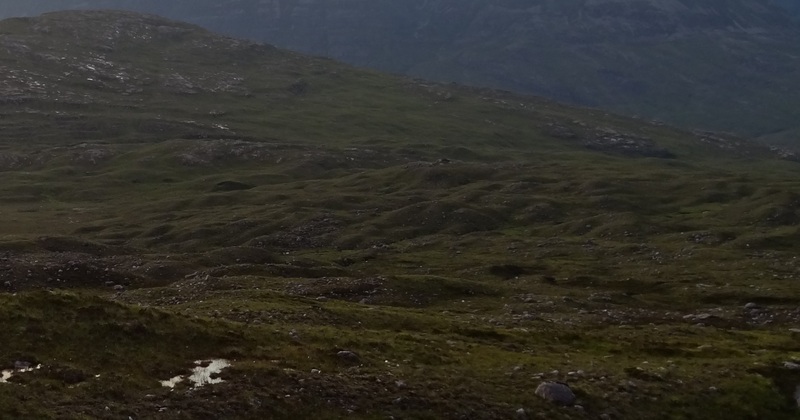 We then followed the Ling Hut path up into the hills though the Coire a Cheud Chnoc (Corrie of a hundred hills). The path starts with an unexpectedly stiff little up and down: here there were a lot of flies, some with bright green eyes! 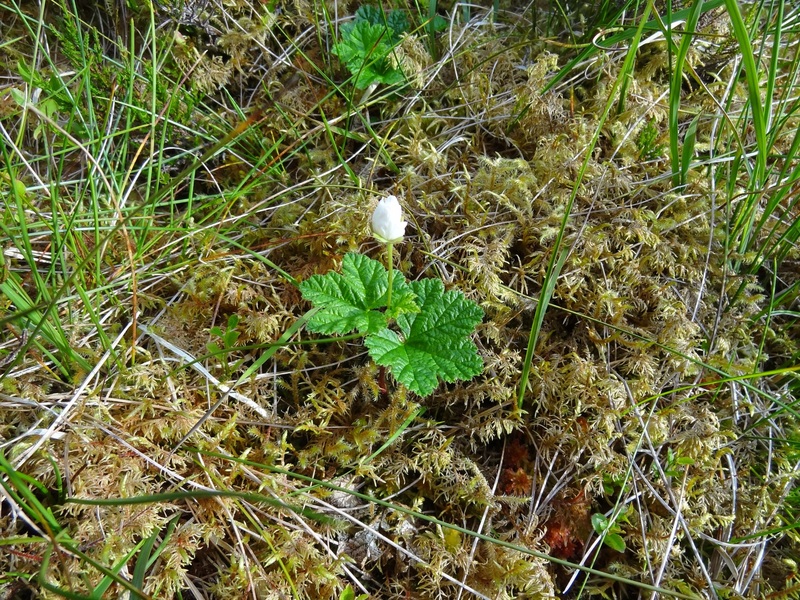 There were lots and lots of magpie moths round here, too, (and a few above the hut, not too far from the floor of the glen: the flies seemed, perhaps fortunately, confined to just the first couple of hundred yards of the walk!). 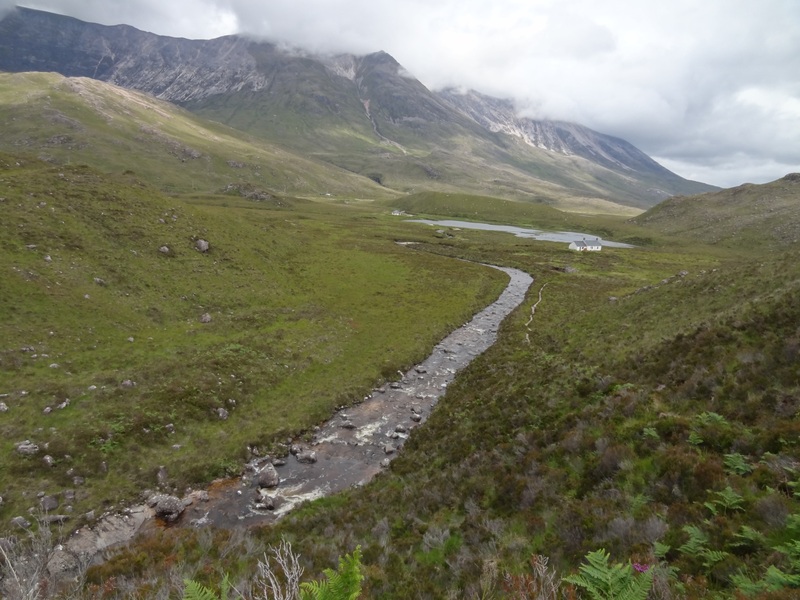 Soon the path descends to Lochan an Iasgair. It's a pretty shore, where we watched greenshank flying. After the hut, you climb up a steep gulley and some impressive waterfalls. 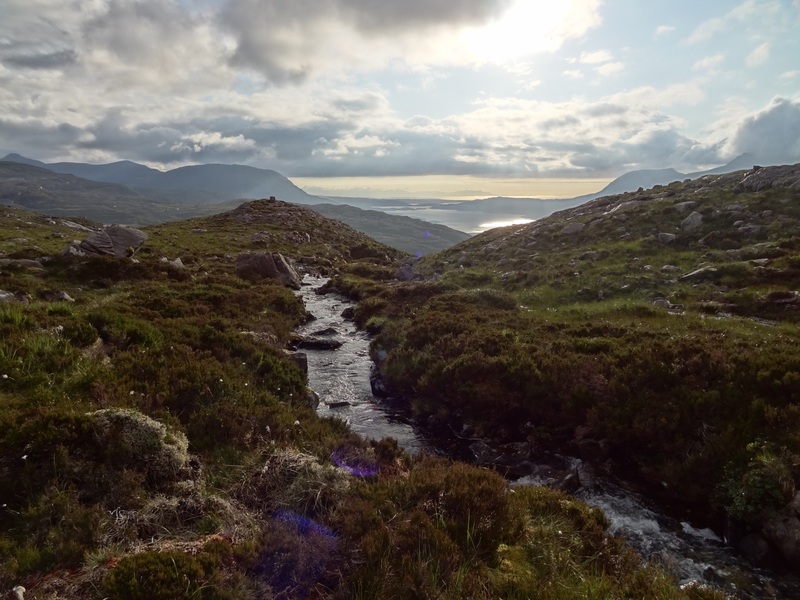 We were impressed with how the path managed to keep heading upwards despite all the hummocks and didn't keep going down as well. This wasn't our recollection of working our own way towards this path through the moraines from Lochan Neimhe many years ago! Once past the falls, the gradients are generally quite shallow, and the path good. 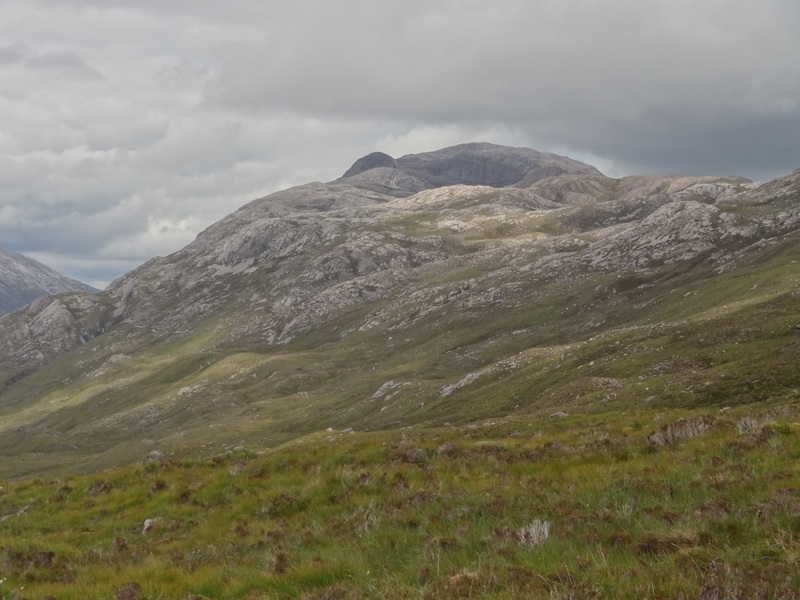 Sgurr Dubh - a possible ascent route? Enormous views gradually opened out as we climbed. 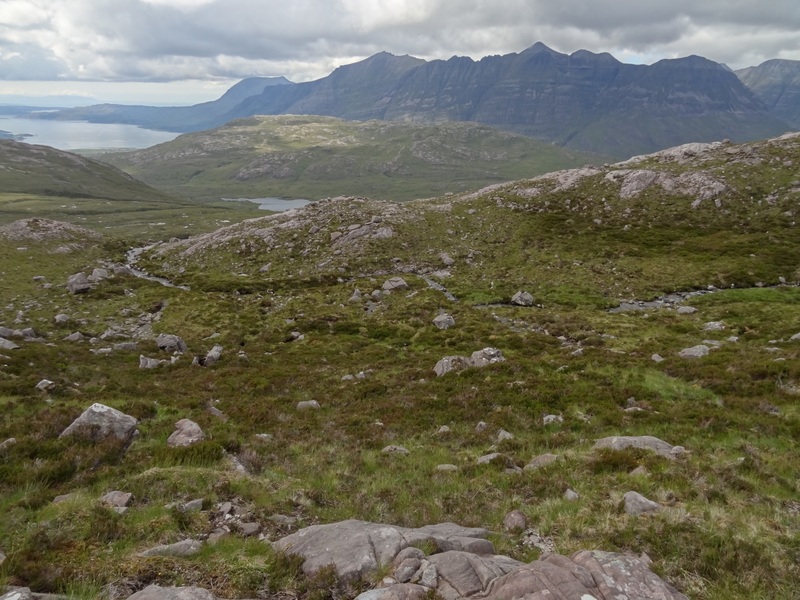 Back to Liathach and forward to the Coulin hills. 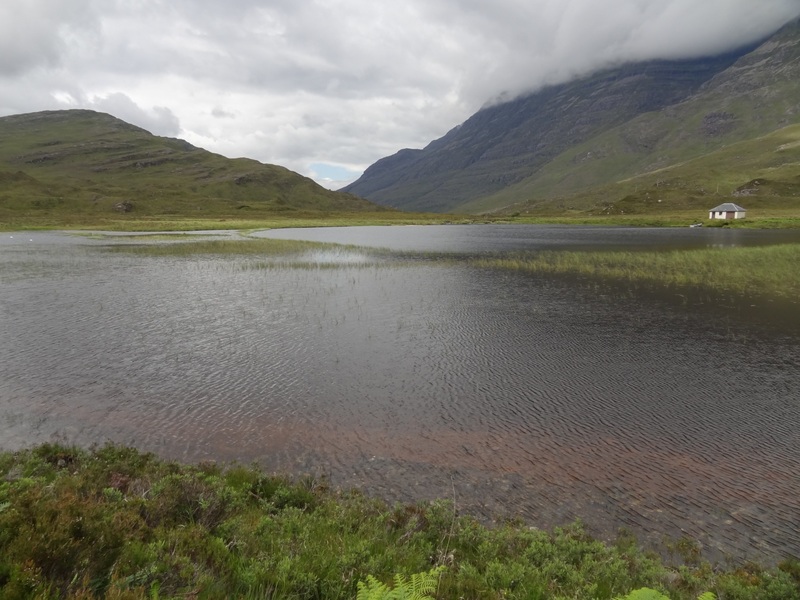 Also to Lochan Neibhe on our right - a great walk on one of our earlier holidays. 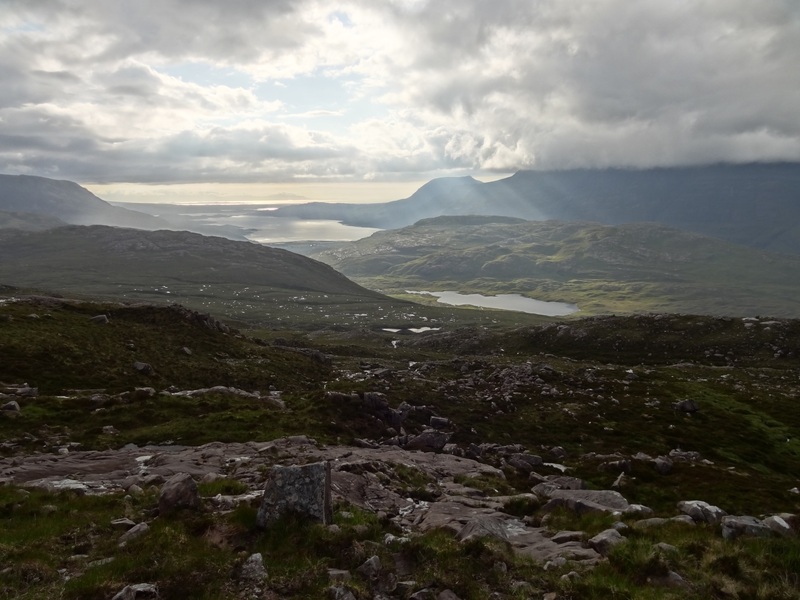 Such an atmospheric place, so beautifully described by Murdoch MacDonald in his "Walking into the past". We'll return to that later on, when the world shone in the evening. Towards the top of the path (approx NG951532, where there's a small lochan) we left it and went our own way east across a flat area of pools, bogs and firm heather but not much rock, around its hummocks and to the foot of the Beinn. 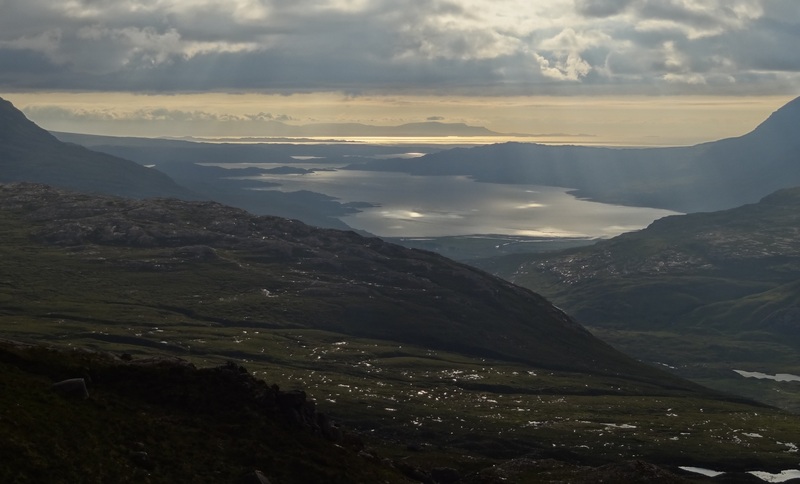 Some of these photos are from the evening light we had on the way down. 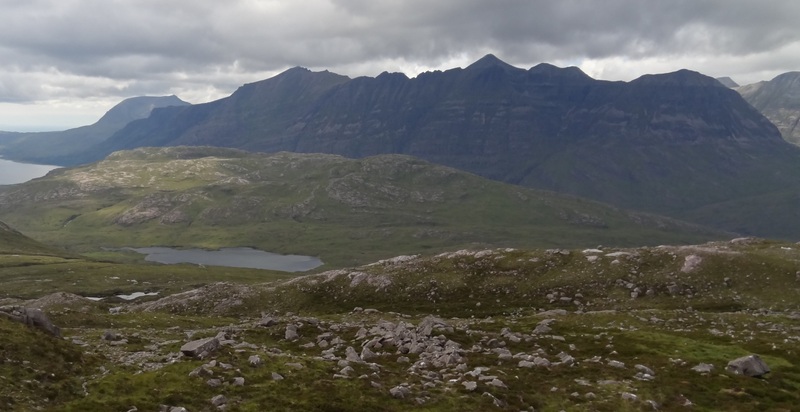 Torridonian strata fanning out on the east of Beinn h'Eaglaise behind Lochan Neimhe, viewed from the path. 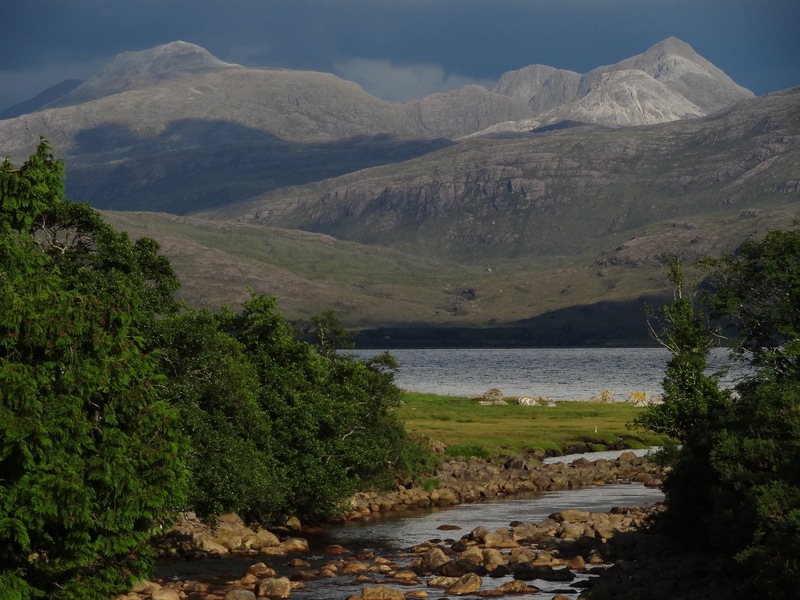 Beinn Damph is poking up to its right. A view early in the day. Coire a Cheud Chnoc from the flat area, now quite distant, but still looking spiky! 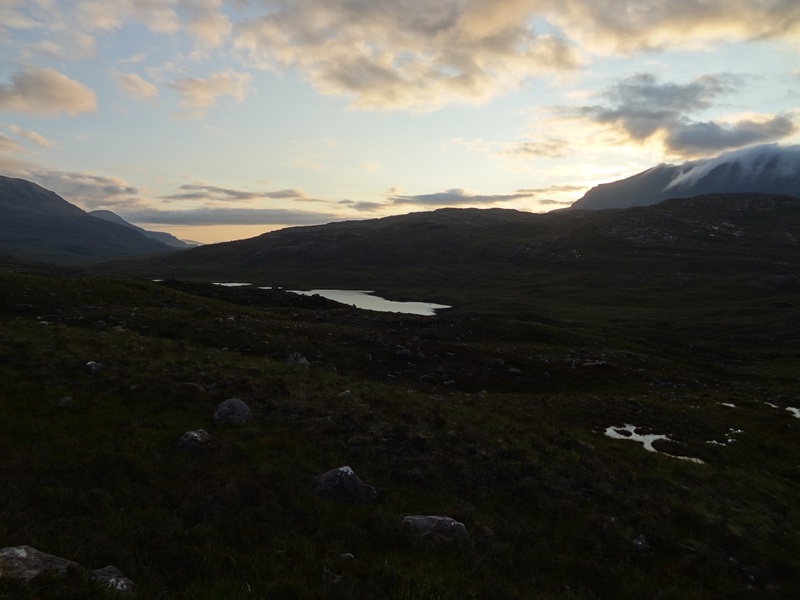 A bit further west around Coire a Cheud Chnoc, this time in the evening. A crystal-clear stream flows here, at one point making a wide curve through a shallow dip. 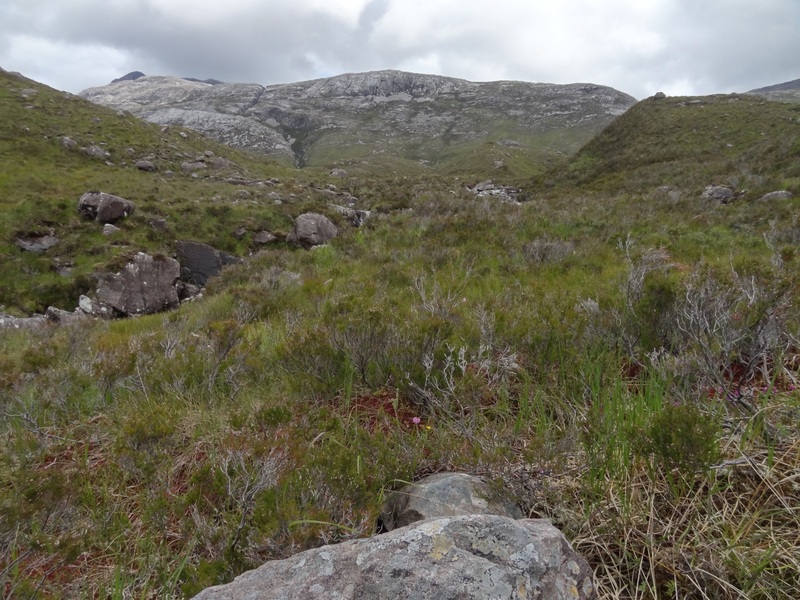 (Probably not quite a coire! 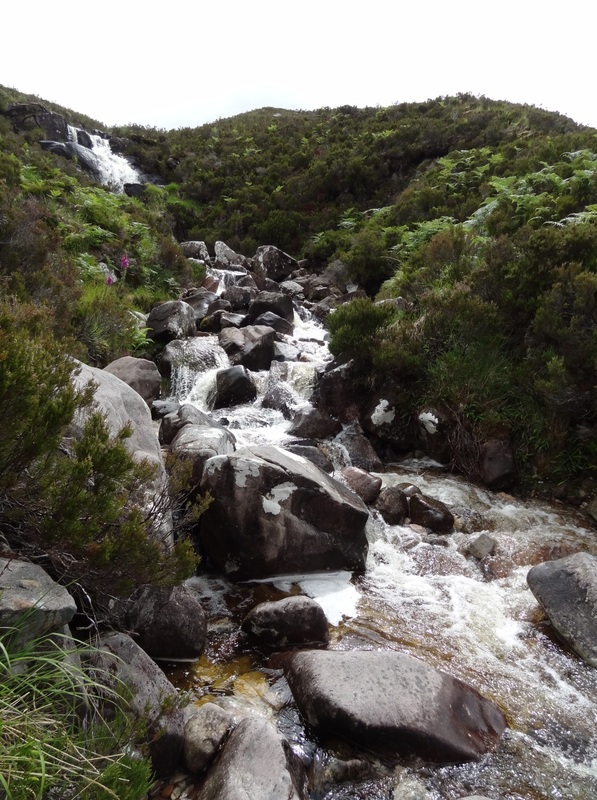 Anyway, it's not named on the 1:25,000 map), at the edge of the coire it drops over some delightful little falls. This area feels quite secluded, although it's fairly open. 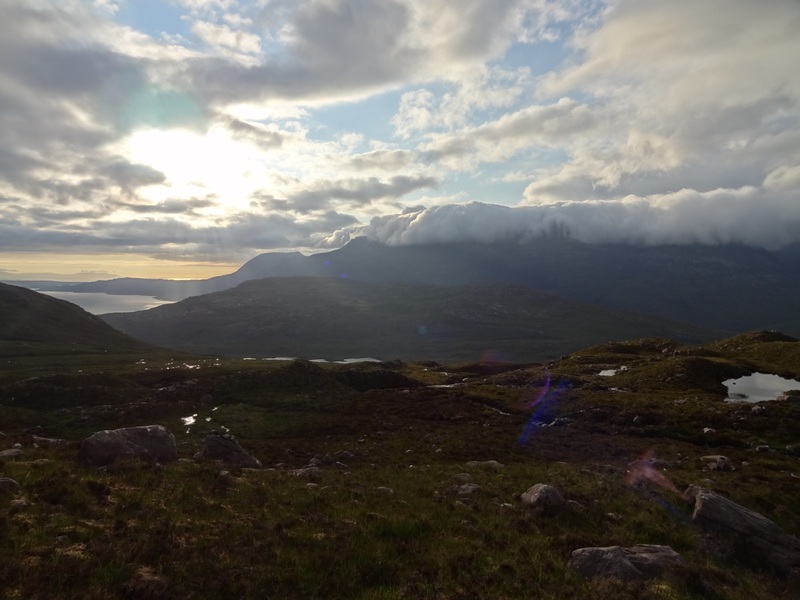 As we'd climbed up from the Ling Hut path to the lochans, the cloud was lifting a more, until we could just about see all the tops of Liathach. 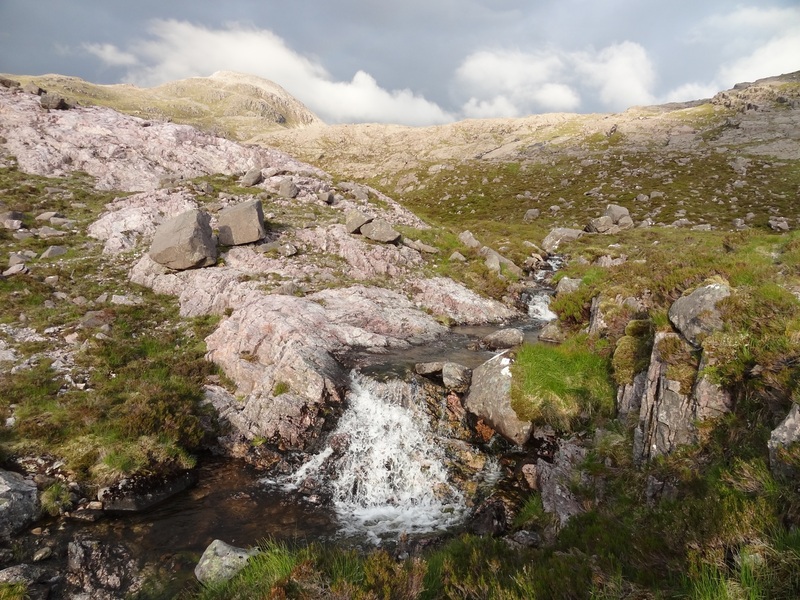 The lower part of the Allt nan Lochan Uaine below the shallow coire. 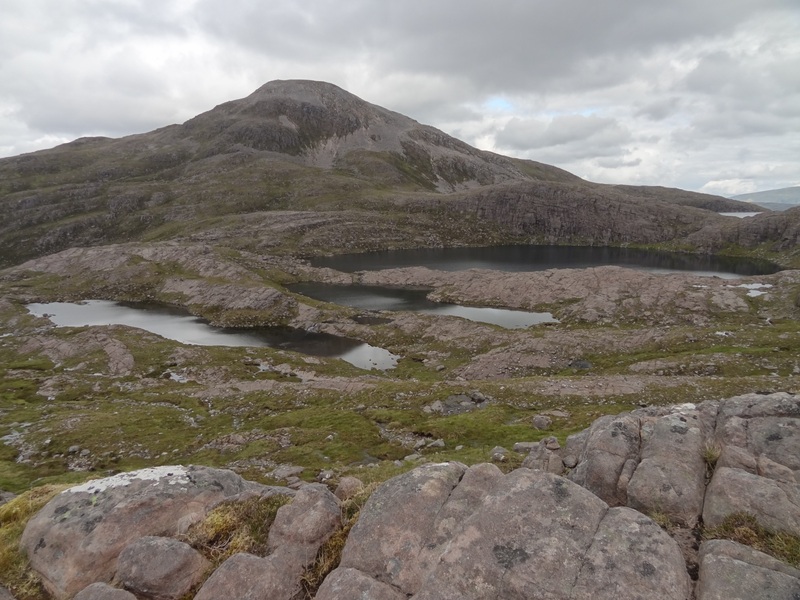 The hill on the skyline is Sgorr an Lochan Uaine. 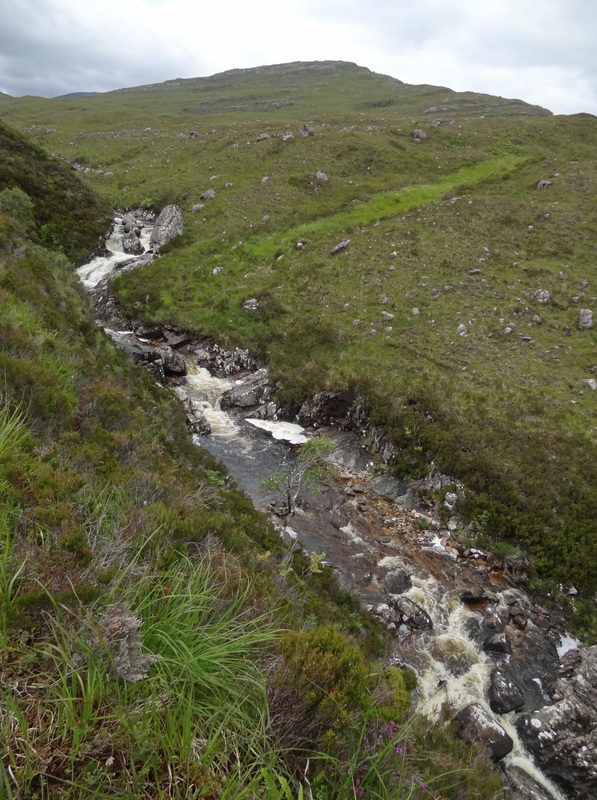 The stream approaching the edge of the coire. 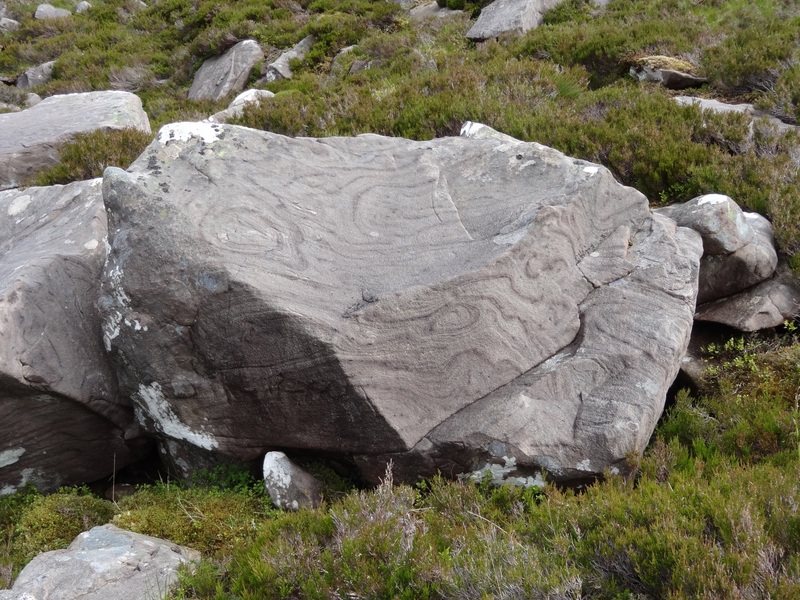 There were some unusual curved patterns in the sandstone in places on this part of the hill: one's used to seeing large-scale strata generally pretty straight in the Torridonian, and not that much discernable structure on the small scale. 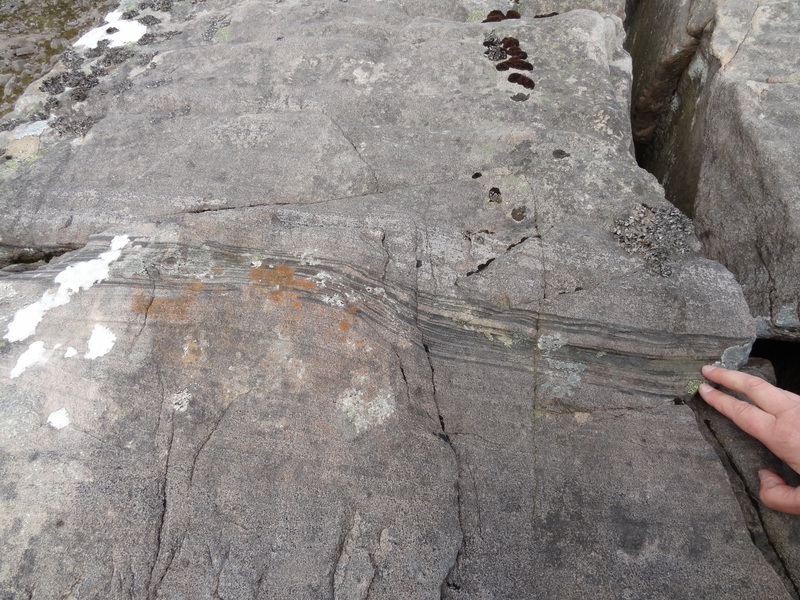 Some of the curves here were due to the convex shape of the weathering in the rock intersecting the layers, but some looked like either surface weathering or folding of some kind: either that, or uneven deposition of sediment? 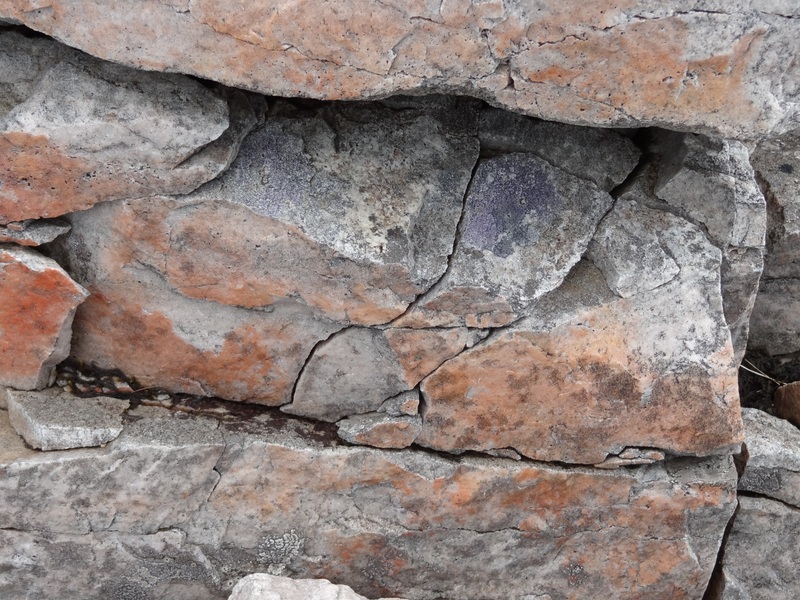 There were also some dark lines in an otherwise more normal-looking boulder - volcanic ash layers, perhaps? 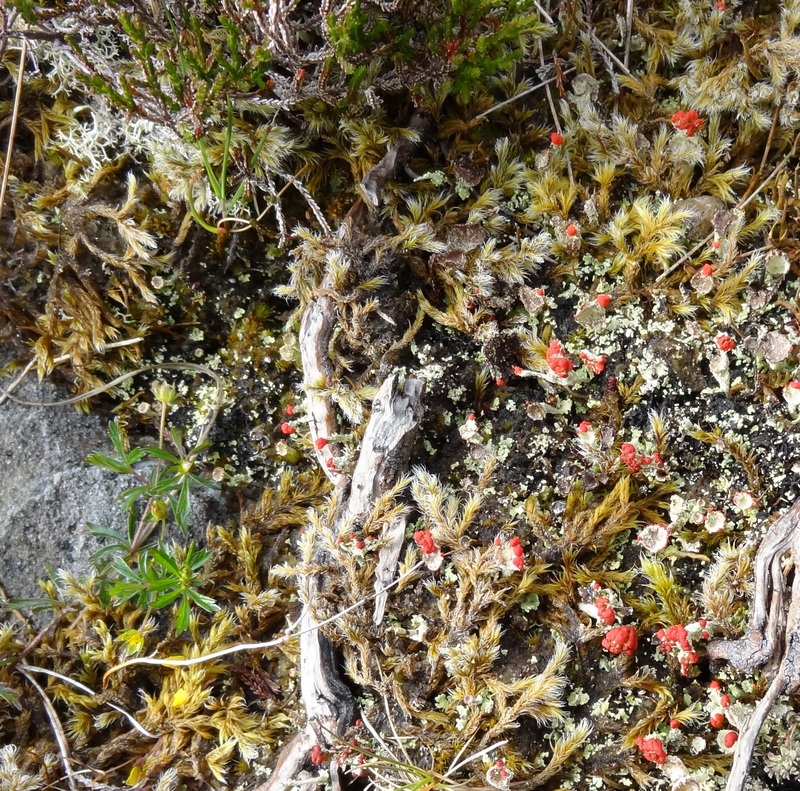 Here also are a few of the lichens and flowers from this part of the walk. 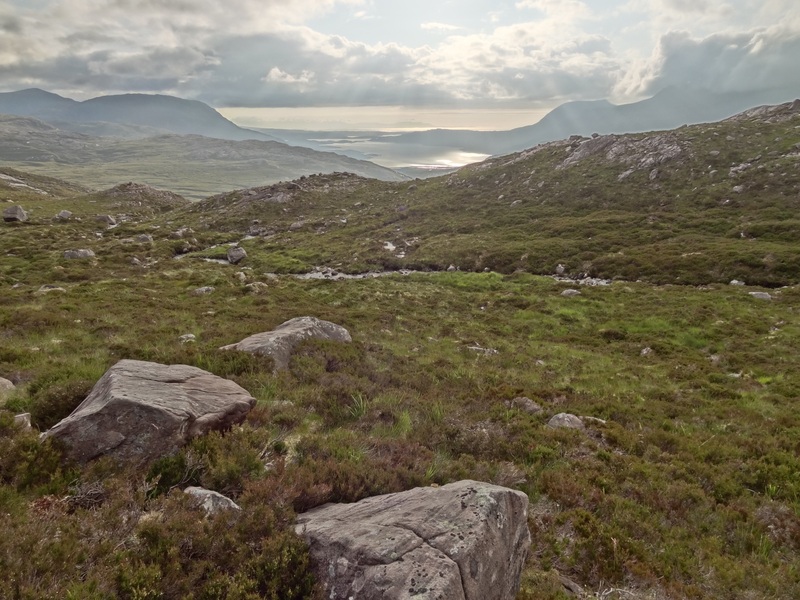 The Lochans Uaine are large lochans in a very stony and wild setting: complex hilly terrain, this. We arrived above them, and, the weather improving a bit but still not looking terribly settled - quite thick in some directions. So we decided to keep on up. 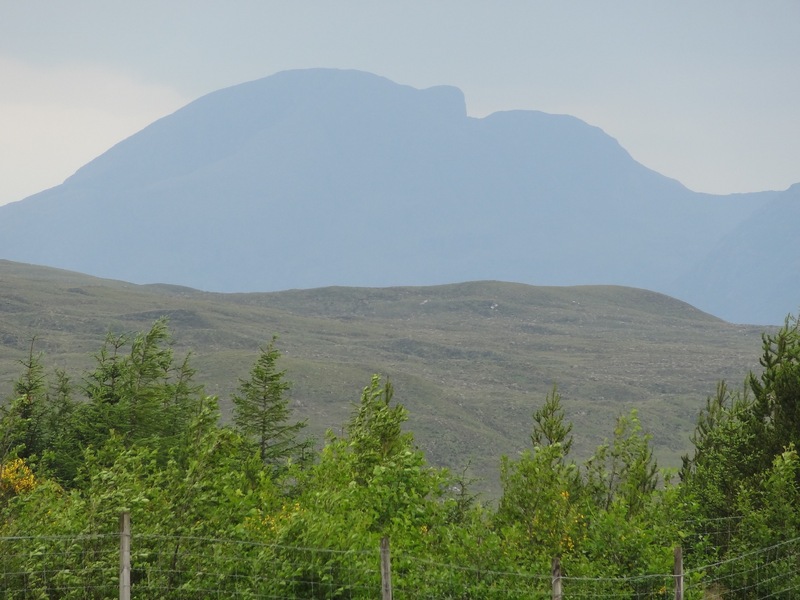 (We'd noticed that Beinn Liath Mhor had been out of cloud for ages when many other tops were still obscured, but didn't want to push our luck!). 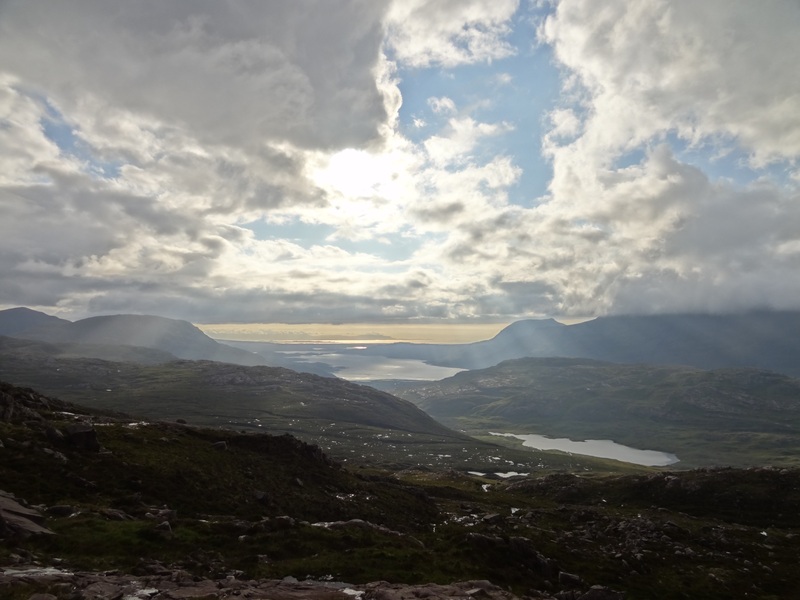 The views down on the lochans were very impressive, though. 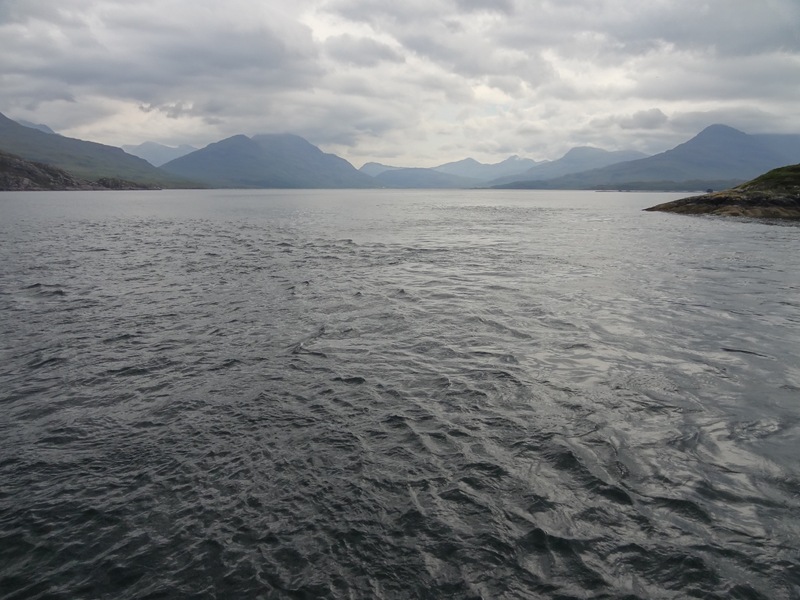 From the Lochans we headed right and up towards the main ridge. This was quite steep but it was generally possible to find quite nice terrain - grassy but not too wet - without too many wiggles and diversions. 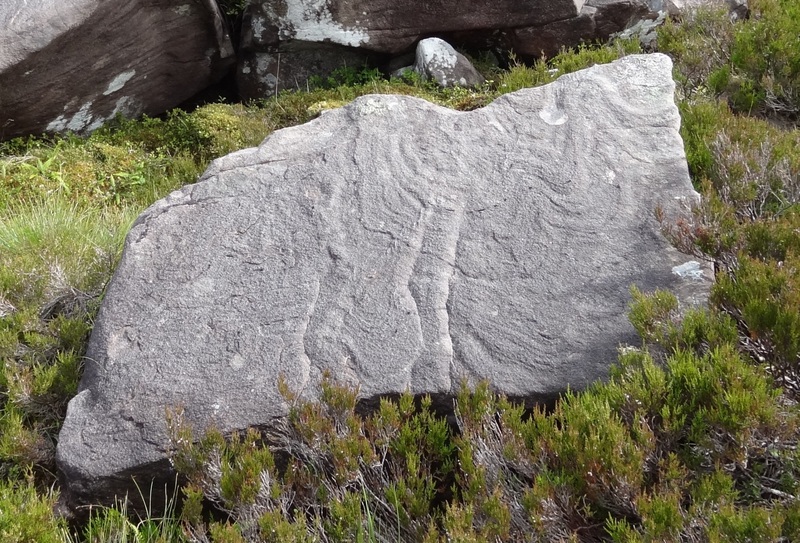 It was still sandstone when we reached the saddle of Beinn Liath Mhor. Then suddenly you look up to a quartzite cone - the foreshortened summit ridge. It looked really steep from a distance but wasn't quite so bad once we were on it: both initial impression and actuality just as Peter Barton said. 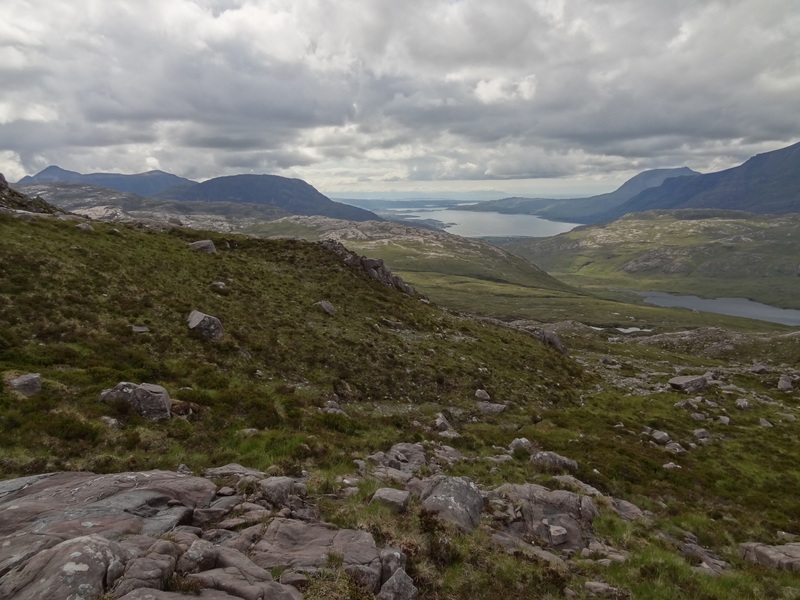 Beinns Damph and h'Eaglaise, temporarily invisible as we ascended a shallow bowl from the lochans, reappeared in style, as did some thicker cloud: Most of Beinn Alligin was also - the fullest view we got of it on this walk. Sgorr A'Chadail, in line with it, looked quite small from here - quite unlike the reality of being near it as we had so much between Alligin and Fasag, or indeed of being on top of it, as we were two days later - probably our most wonderful day out. 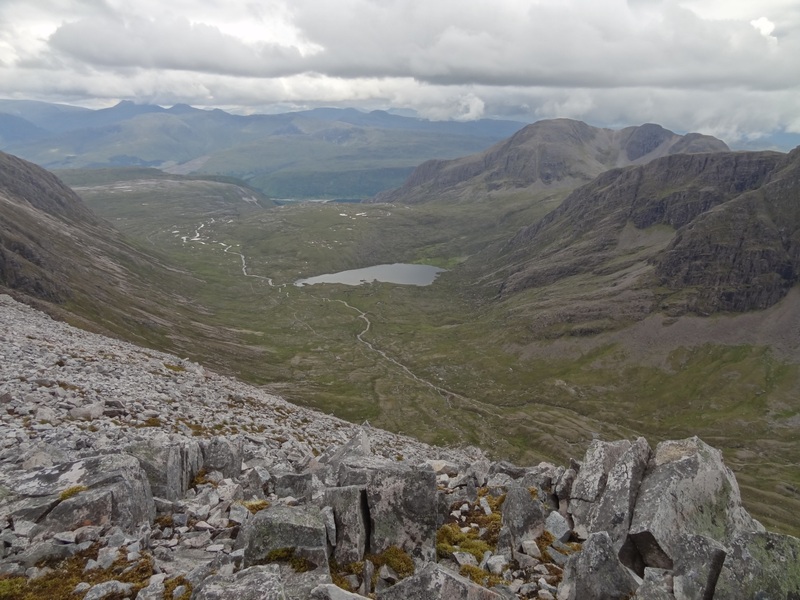 Beinns Damph and h'Eaglaise from the saddle. A wider view west from the saddle. 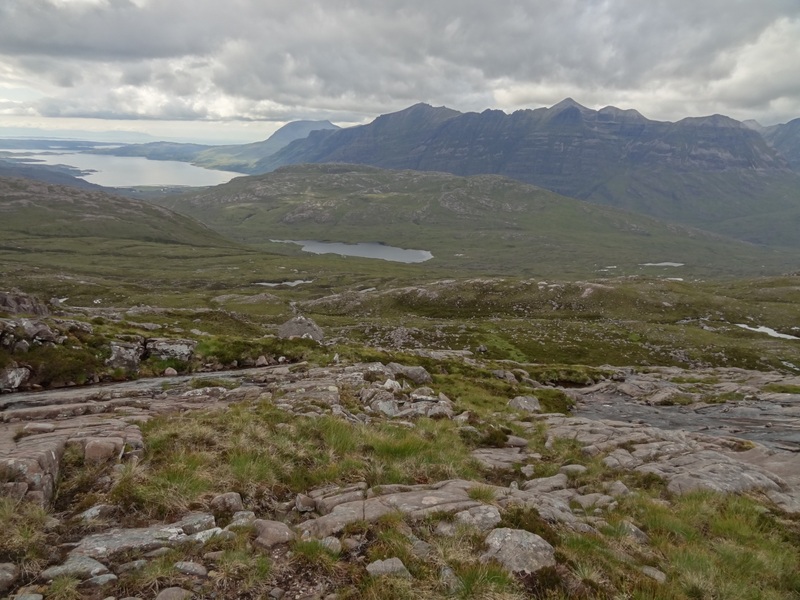 Beinn Alligin is the rightmost skyline, and Sgorr A'Chadail is the next horizon below it. 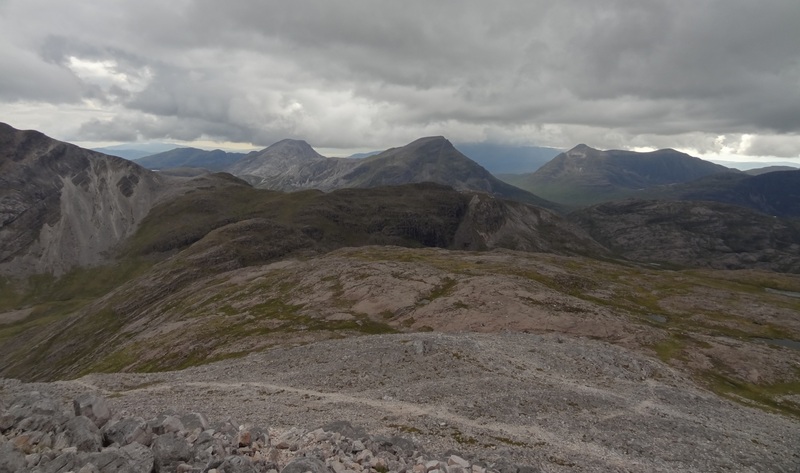 Looking south from the saddle, across upper Coire Lair. The large, flat, sandstone slabs, and gravelly steps, are quite typical of this part - great for walking! Looking up the quartzite ridge: easier walking than it looks! 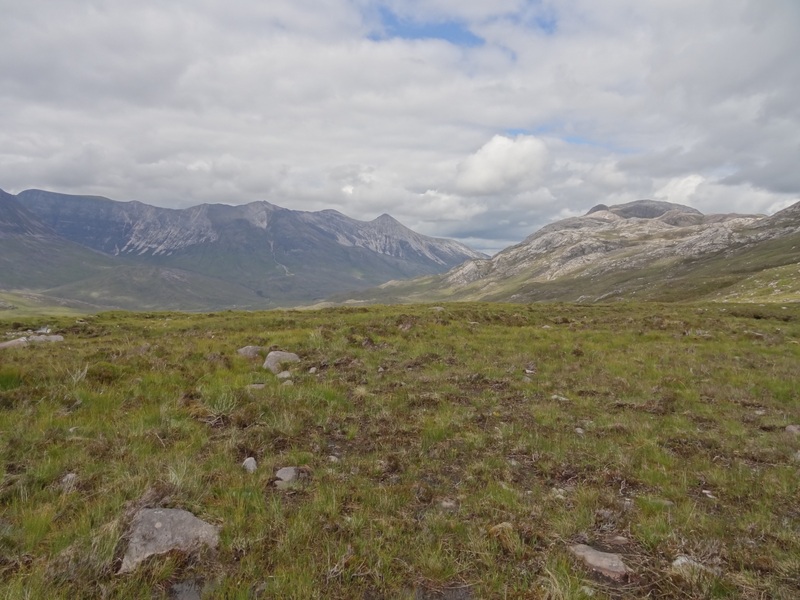 More of the Coulin forest appearing: the bealach between Coire Lair and Coire Granda, Meall Chean Dearg (centre) with An Ruadh Stac to its left. 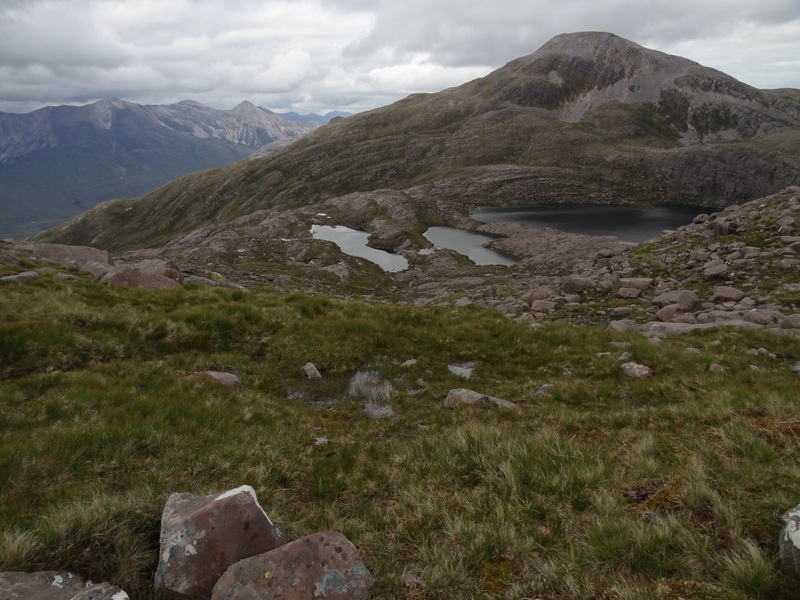 The lochan just disappearing behind the (near) ridge of Sgorr Ruadh is Loch a'Mhuilinn just behind the small part of Meall nan Ceapairean that's visible. 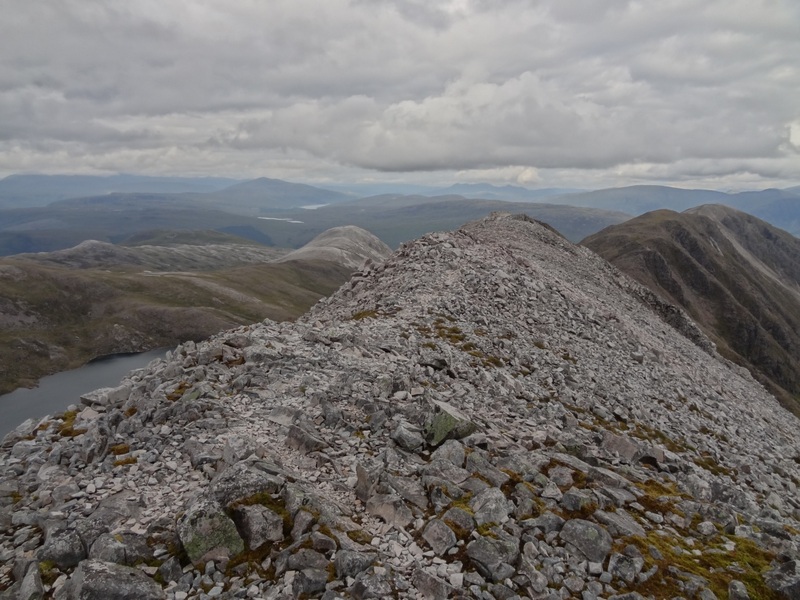 Looking along the summit ridge of Beinn Liath Mhor, from the summit. 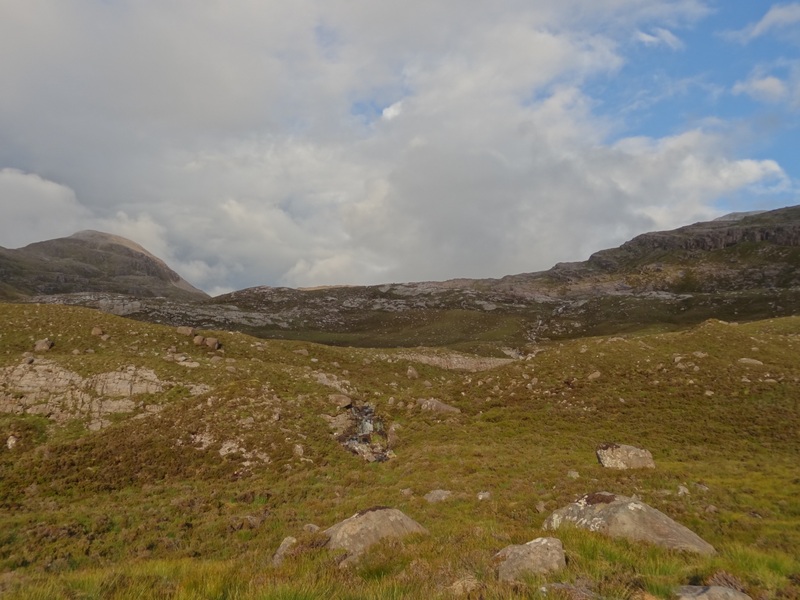 To the right it descends to Coire Lair. Beinn Liath Beag is the light-coloured hill to the left of the ridge. 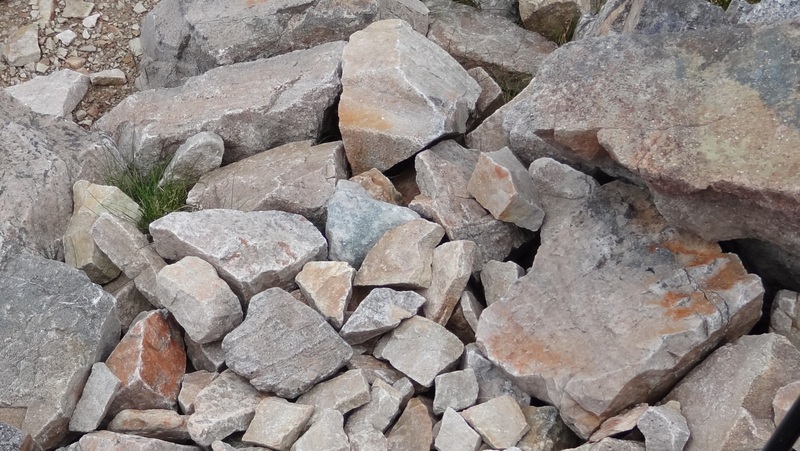 Colours in the summit rocks. 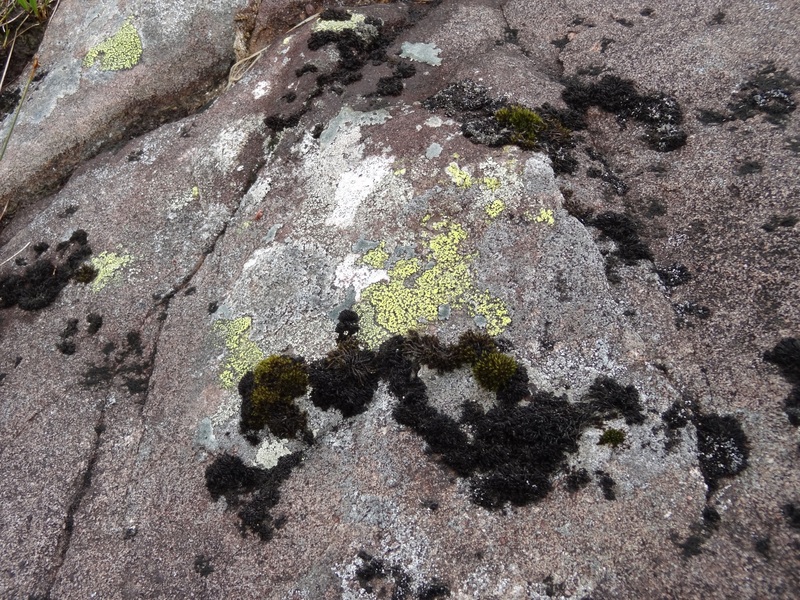 The purple in the last of these photos is lichen, rather than mineral. 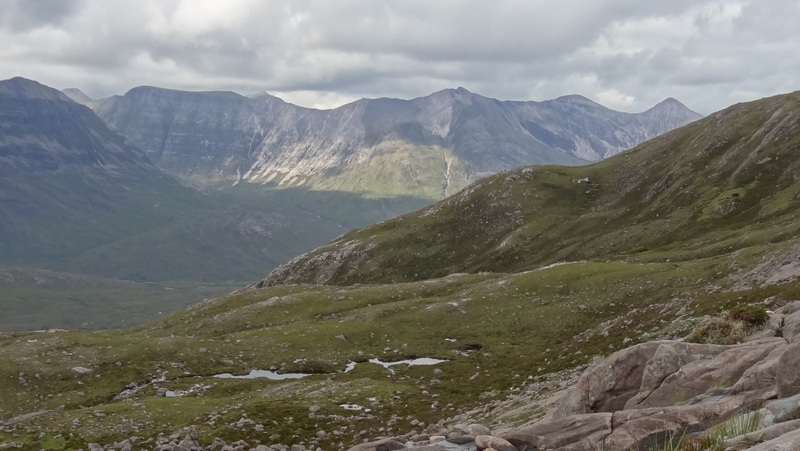 Looking down Coire Lair: rightmost is the south end of Sgorr Ruadh: behind it Fuar Tholl. 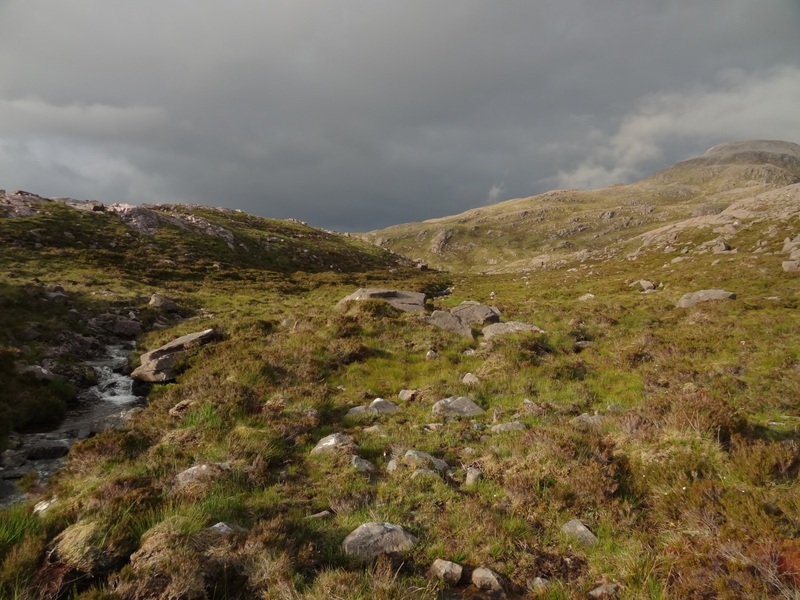 Following the Allt Lair down from Loch Coire Lair (large loch centre left, after which the Allt becomes a river! 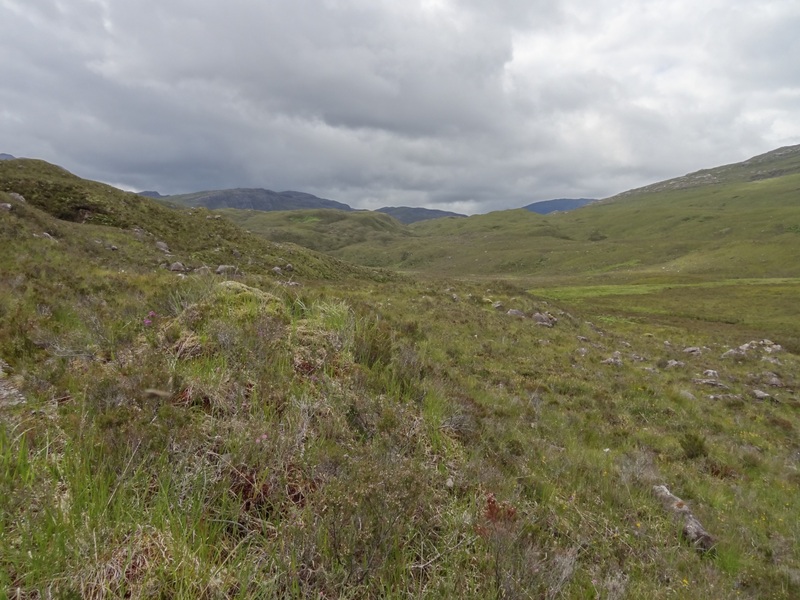 ), it bends to the right before disappearing towards Loch Dughaill (just visible beyond). 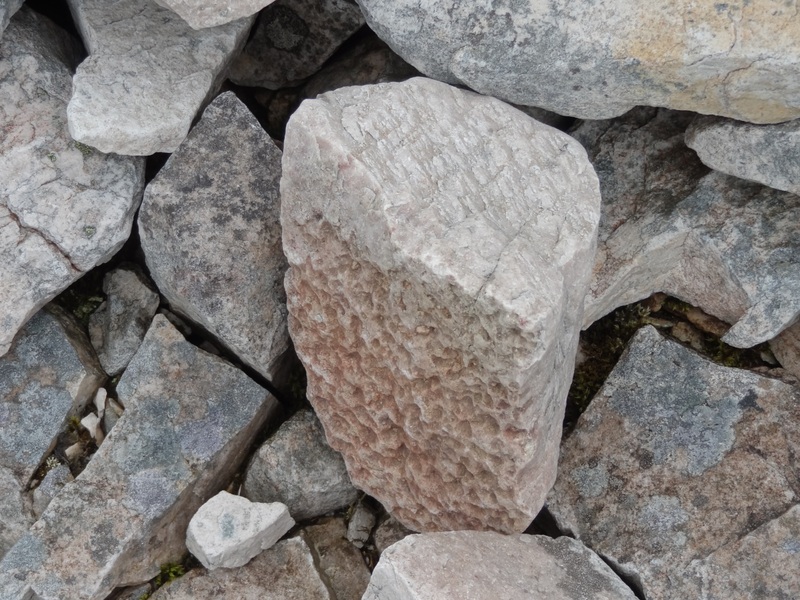 It was nice to renew acquaintance with the scree-cat after our walk up Coire Lair the previous year: it's the light patch beyond and to the right of the furthest visible part of the Allt. This is a colour photo, honest! 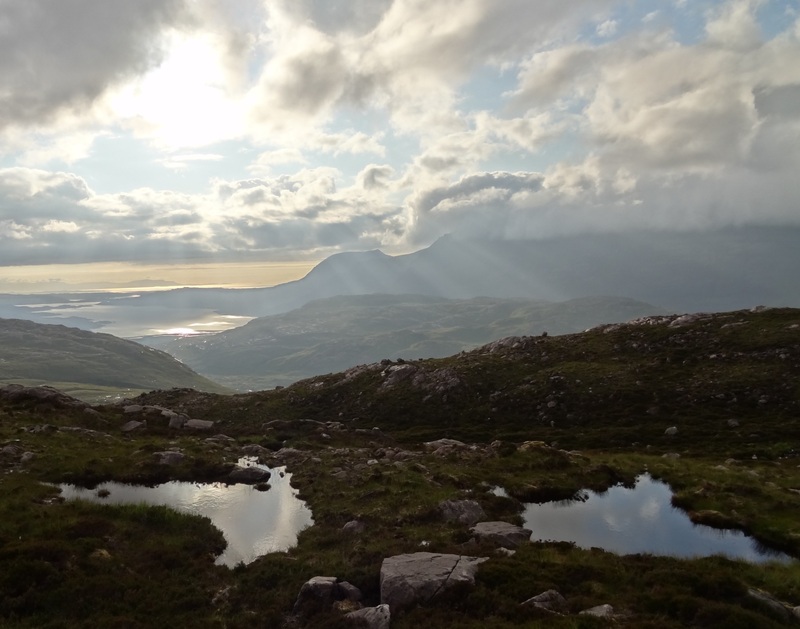 The sun started to reflect on the sea between Upper Loch Torridon and Skye, then it came our way too: first by proxy: the myriad pools scattered over the hills below us started also to brighten under still-dark skies. 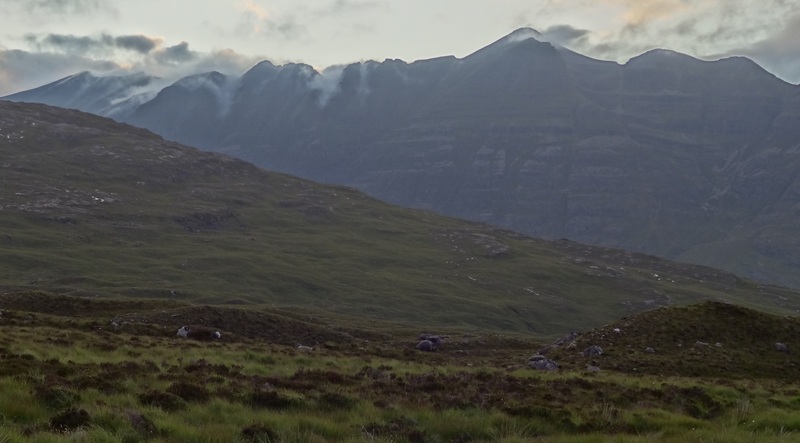 Then we were bathed in sun at the same time as Liathach's hill cloud became denser, thinner, then dispersed again. Great stuff! 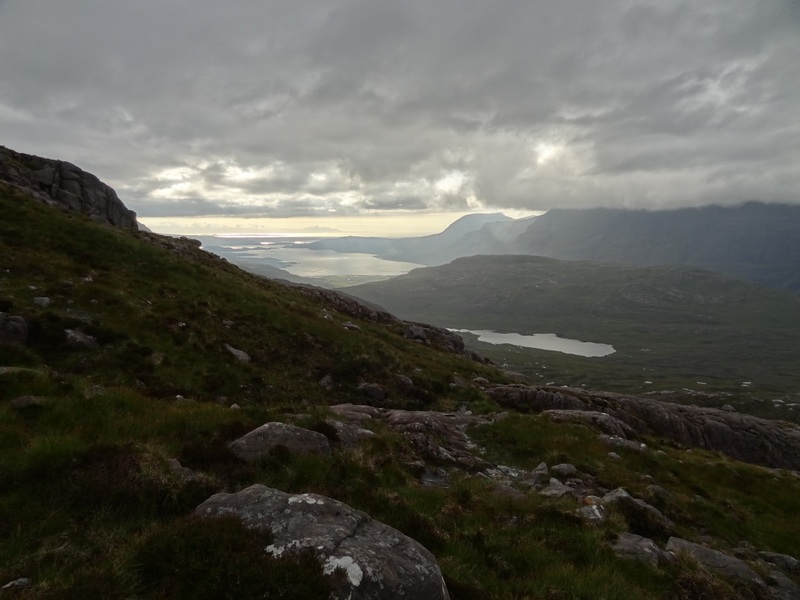 The lightshow faded as we finally descended back to Glen Torridon and lost our views to the sea and Lochan Neimhe. So we were back to the bikes as dusk imperceptibly faded, as happens in midsummer here. It was great to have the bikes to save us the long road walks: these are often what finished us off on our long days out in the past. 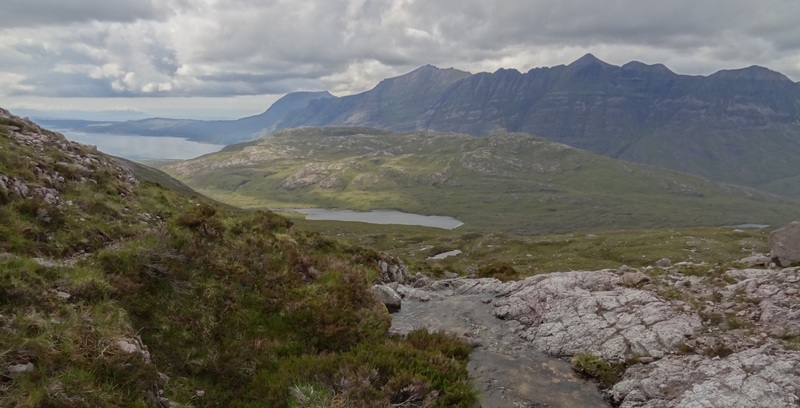 We had a splendidly fresh ride back down Glen Torridon - not seeing a car the whole way back to the cottage! 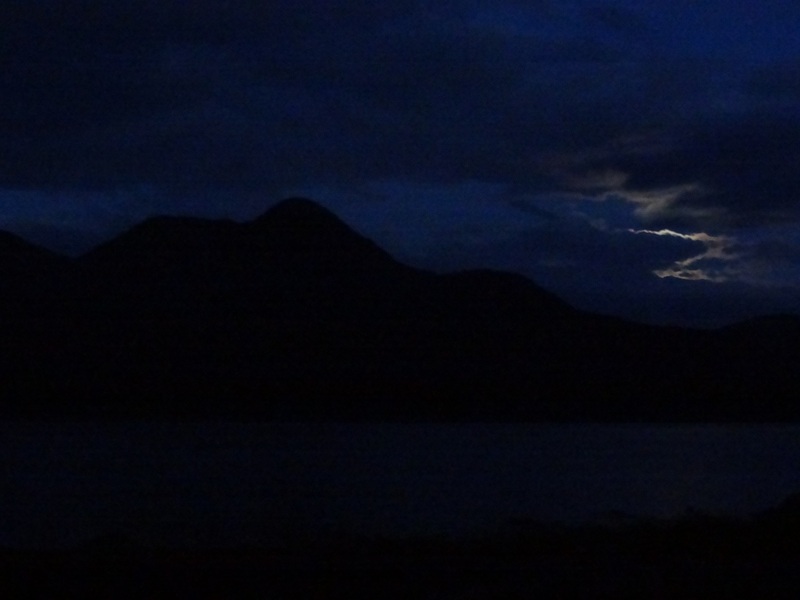 What a wonderful area... We got back to the to the cottage at about 11.45 p.m., just as the moon backlit some clouds above Beinn Damph, across the Loch: a very atmospheric end to another wonderful day out - a walk that took us through amazing scenery, enthralling in any weather, let alone the blaze of glory we witnessed from high up. 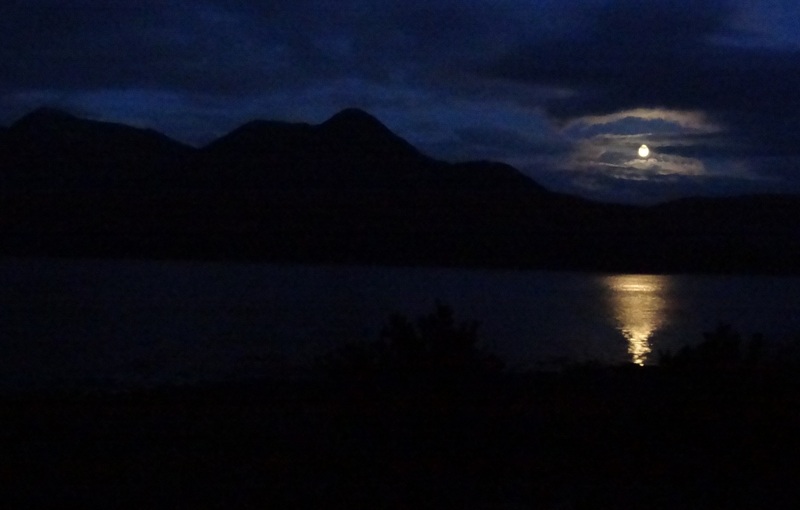 Moonlight at the end of our walk. 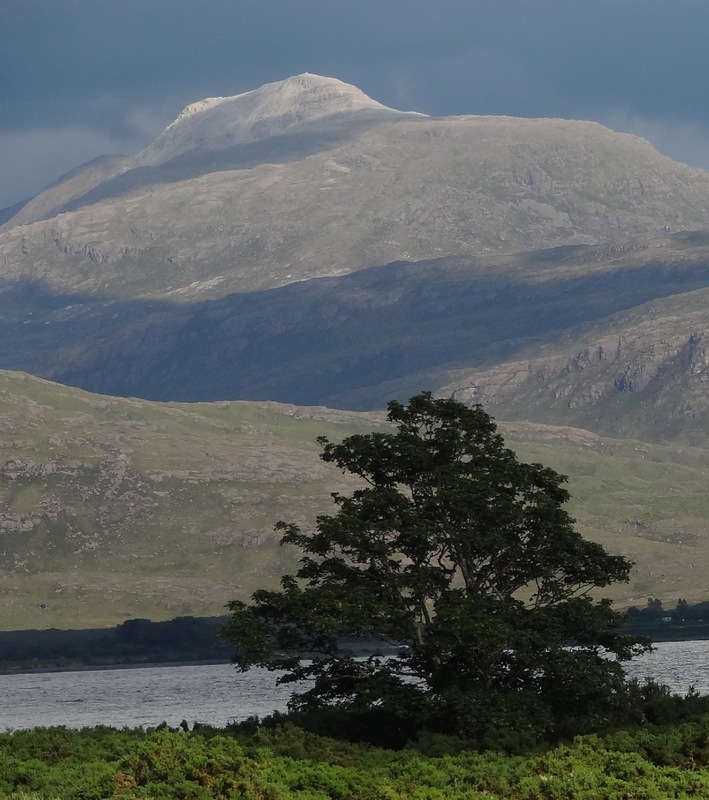 The shadowy hill across the loch is Beinn Damph. (Text and photos by Daniel and Clare Gordon. April 2012).